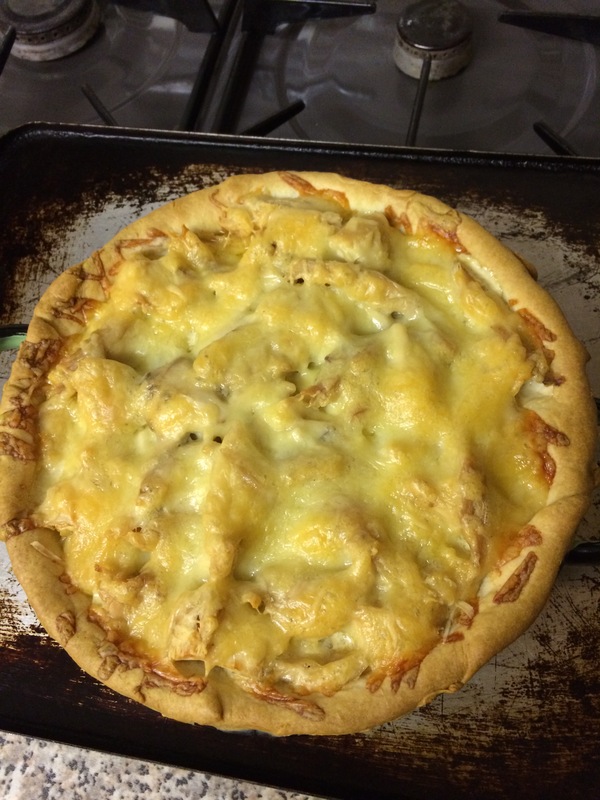 We had some cooked chicken to use up, which gave us the opportunity to try Tarte au Poulet, a recipe from Supercook. Tarte au Poulet is a pastry flan filled with cooked chicken meat, mushrooms, chopped lean ham, seasoning, cayenne pepper, cream and Gruyère cheese. We served this very tasty dish with a green salad. 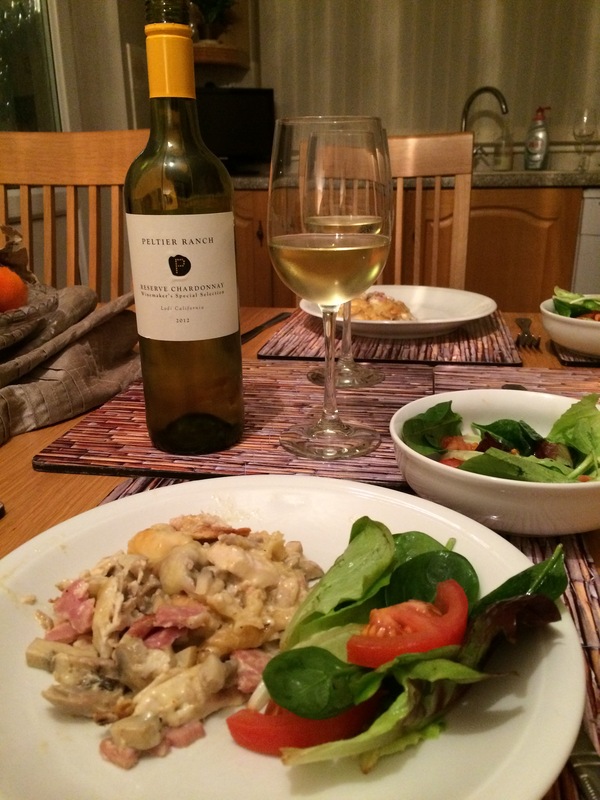 We paired the meal with a bottle of Peltier Ranch Lodi Chardonnay 2012, a Californian white from the Wine Society. We loved the creamy vanilla butteriness with tropical fruits, especially pineapple. The oakiness had an affinity with the spiciness from the cayenne. 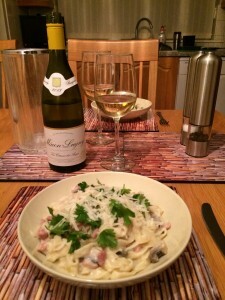 A very good match and even better than a previous pairing with Pork Stroganoff. We fancied doing Pork Stroganoff and found three recipes we liked online. We cooked Mary Berry’s Pork Fillet Stroganoff from BBC Food and intend to try the other two recipes in future. Strips of pork fillet are cooked with onion, paprika, mushrooms, soured cream, lemon juice and garnished with parsley. 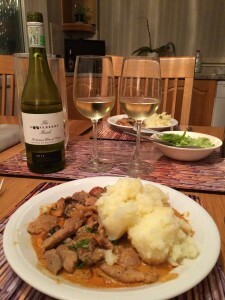 We served the pork with mashed potato and green salad. 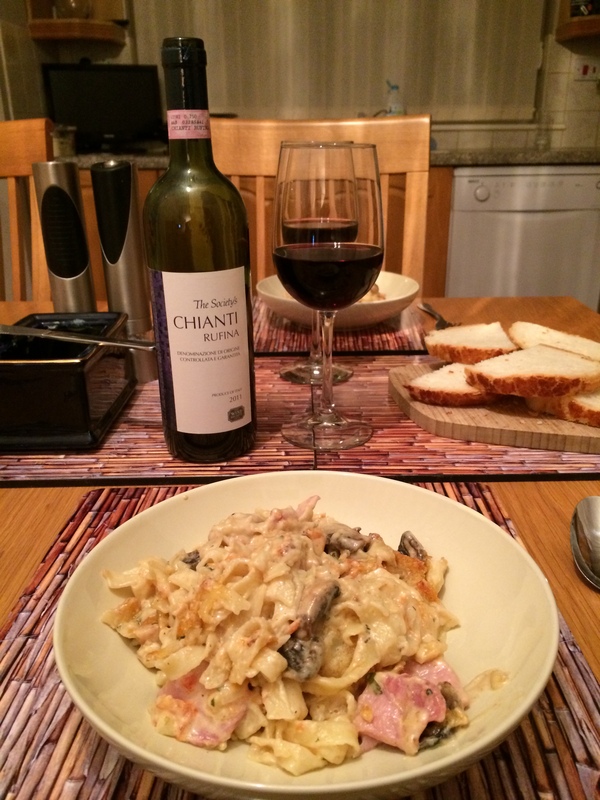 We thought this was a fairly mildly-flavoured Stroganoff, but pleasant. We tried a bottle of The Gooseberry Bush Colombard/Sauvignon 2013 from the Sunday Times Wine Club (previous food pairings here and here). This didn’t work at all, so we switched to a bottle of Peltier Ranch Lodi Chardonnay 2012, a Californian white from the Wine Society. 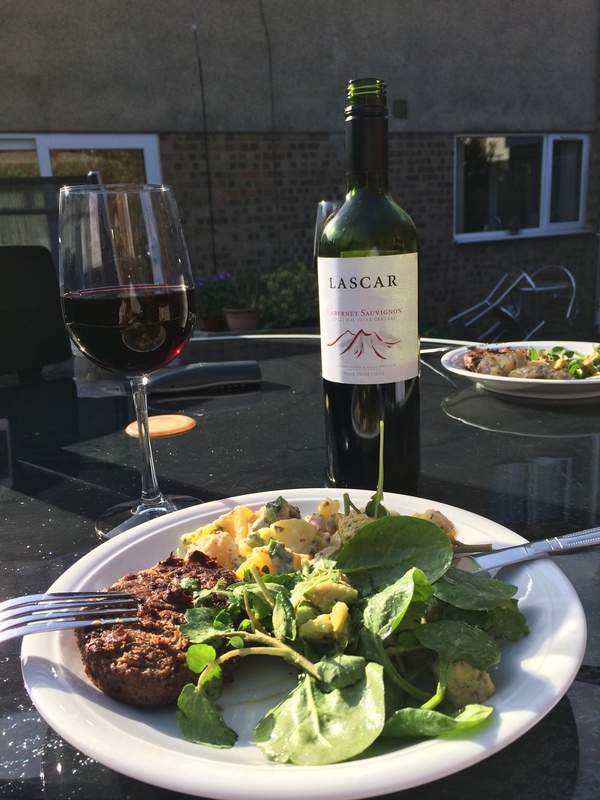 This wine is subtly-oaked and we tasted creamy pineapple and other tropical fruit flavours. The wine did not overwhelm the light flavours of the meal and was a good match. 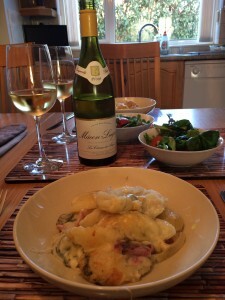 We discovered an interesting recipe by James Martin on the BBC Good Food website. 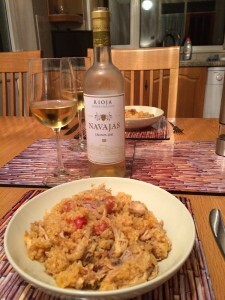 It’s called Chicken and Chorizo Rice Pot and is described as an alternative to Paella. Chicken pieces are cooked with onion, red pepper, garlic, chorizo, tomato purée, thyme, white wine and chicken stock. Rice is stirred in. A very tasty and enjoyable meal. 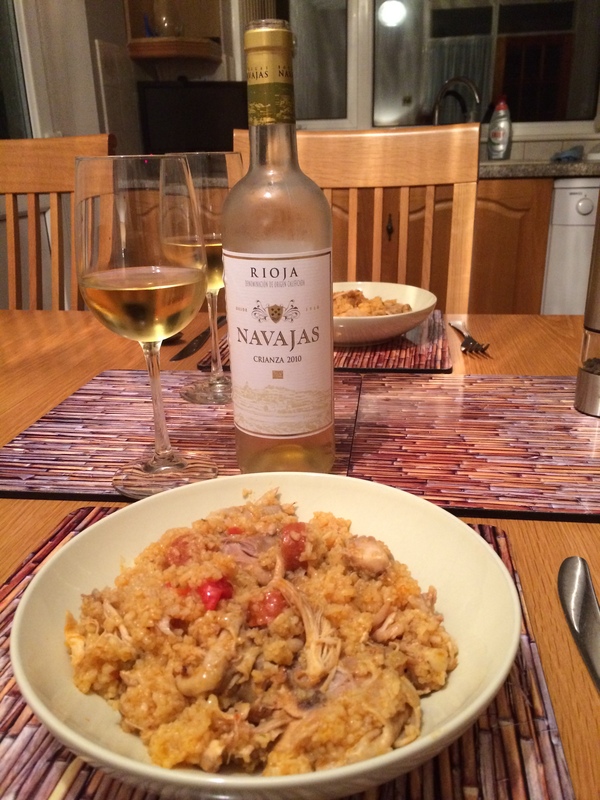 We opened a bottle of Navajas Rioja Blanco Crianza 2010, a Spanish white from the Wine Society. The wine is heavily oaked and this was evident in the strong creamy vanilla flavours throughout with hints of pineapple. 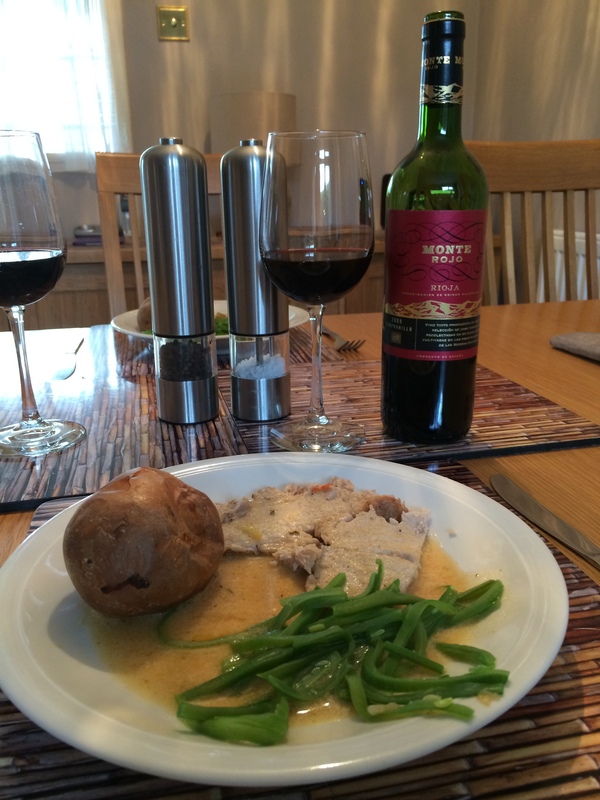 We thought the Rioja was a very good match with the meal. We stayed with oak for the leftovers a couple of days later, but this time went for a bottle of Wither Hills Marlborough Chardonnay 2011, a New Zealand white also from the Wine Society. We detected pineapple on the nose and buttery, creamy pineapple flavours with a lingering slightly sharp grapefruit finish. The wine was another very good match. 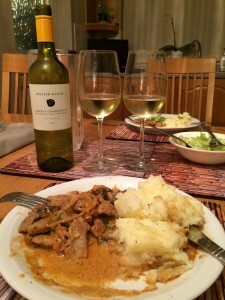 We tried Loin of Pork with Garlic and Vegetables from Supercook. The pork is braised in stock with potatoes, tomatoes, thyme and garlic and finished with a rich sour cream sauce. We served the pork with green beans and a jacket potato. Initially, we decided on a red wine and opened a bottle of Monte Rojo Rioja 2009, a full-bodied rich Spanish Tempranillo from the Sunday Times Wine Club. This smooth red with a hint of vanilla oak was a near miss with the dish, so we set it aside. We opted for a bottle of Brancott Marlborough Chardonnay 2013, a New Zealand white from Costco. This was fresh, creamy, buttery with flavours of melon, pineapple and nectarine. A good match with the meal. We cooked Pimiento Chicken from Supercook. Chicken pieces are cooked with onion, pimientos or red peppers, tarragon, chicken stock, white wine, beurre manie and double cream. The dish has a Spanish feel to it so we served it with Spanish Potatoes from the BBC Good Food website. Small chunks of potato are mixed with tomato purée, smoked paprika, garlic, lemon juice and parsley and then roasted. 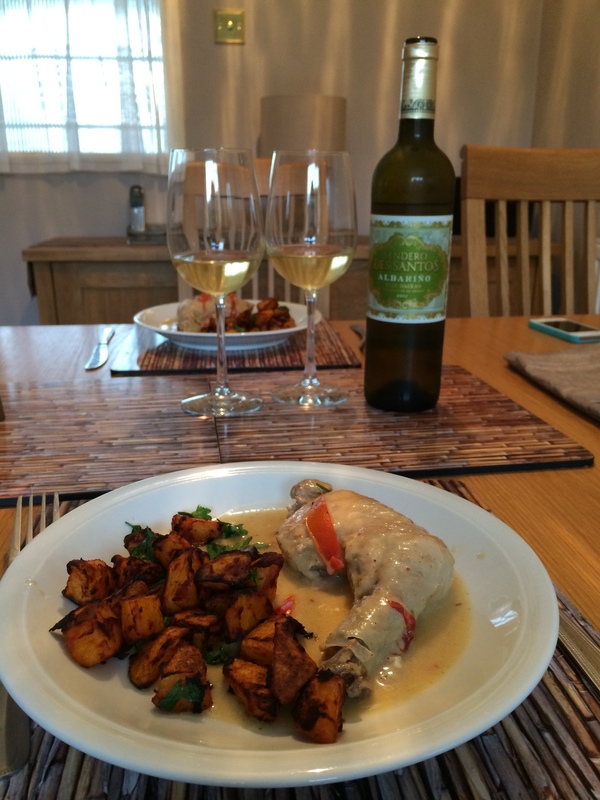 We thought a bottle of Sendero des Santos Albarino 2012, a Spanish white from the Sunday Times Wine Club would make a good pairing. We found the wine smooth and creamy with flavours of summer fruits especially peaches and nectarines. There was a tangy lemony finish. We thought this quality wine was a very good match with the meal. 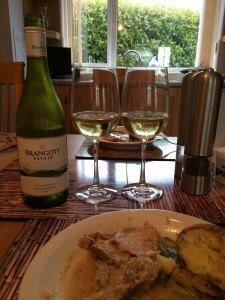 We had the remainder of the chicken a few days later and decided to try a Chardonnay. This served as an object lesson on why its important to to get the oakiness right when choosing the right pairing. At first we thought oak might be a problem so opted for a bottle of Lindemans Bin 65 Chardonnay from Costco. Nothing wrong with the wine, but we knew straight away more oak was needed and set it aside. 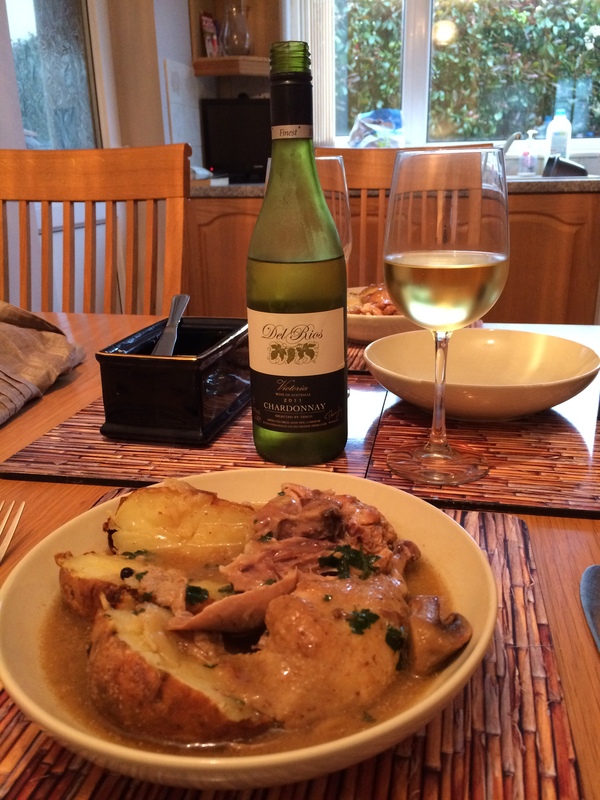 We chose a bottle of Wither Hills Chardonnay 2011, a New Zealand white from the Wine Society. Decidedly more oaky and we tasted peaches, sweet melon and plenty of creaminess with a touch of citrus on the finish. This delicious wine was superb with the chicken. 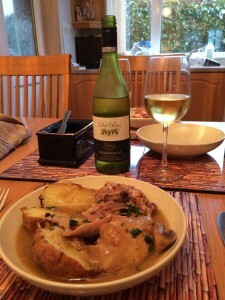 We slow-cooked a Chicken and Beer Stew recipe from the Slow Cook Book. The chicken pieces were cooked with onions, brandy, mushrooms, bouquet garni, crushed juniper berries, beer (a can of Hobgoblin in this case), chicken stock and double cream. The meal was garnished with parsley and served with a jacket potato. Very enjoyable too. We thought a not too oaked-Chardonnay would be good and opened a bottle of Tesco’s Finest Del Rios Victoria Chardonnay 2011. 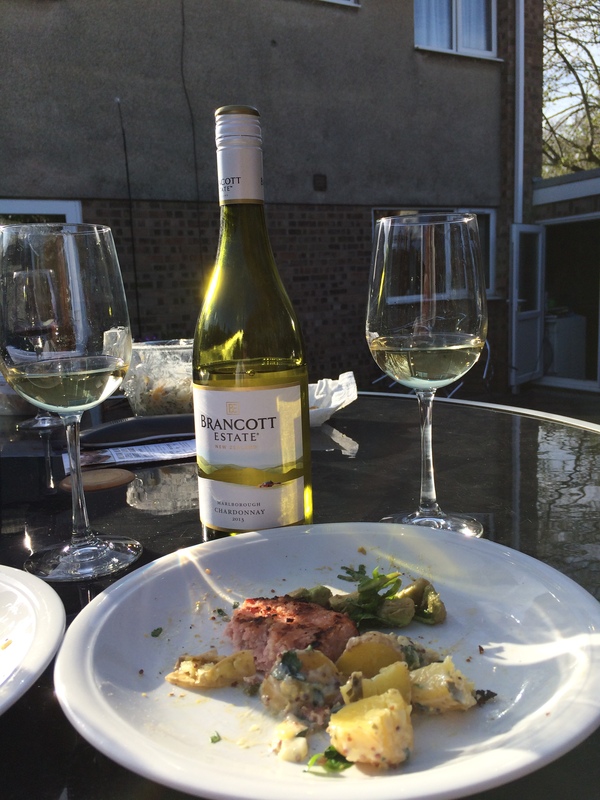 This Australian white was lemony, with fresh tropical fruits and a smooth creamy finish that intensified as the meal progressed. A very good match. 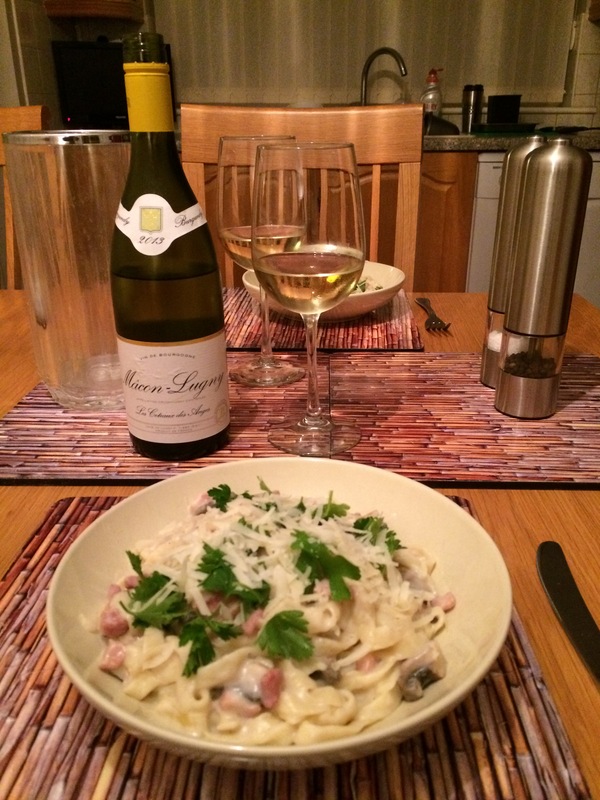 We tried Tagliatelle Verde with Bacon and Tomatoes from Supercook. However, we couldn’t find any green tagliatelle in our local shops, so used plain. Never mind. 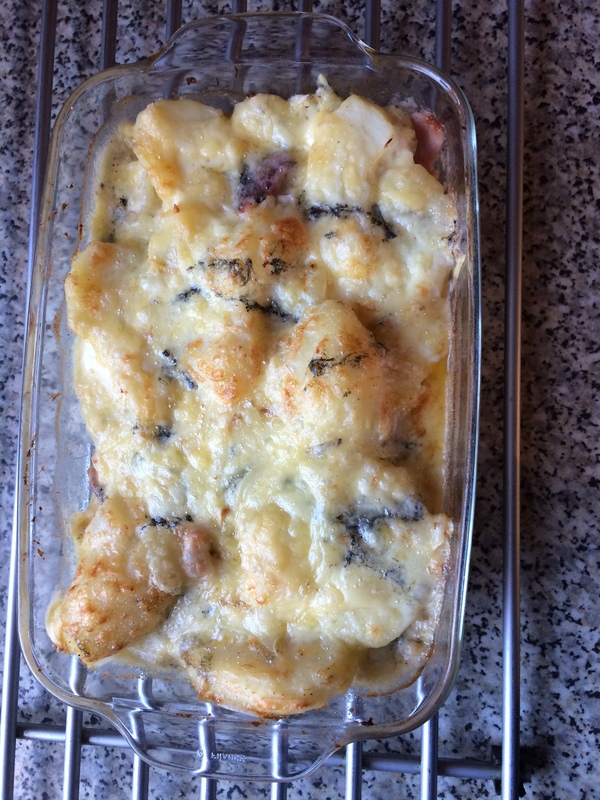 The sauce for the pasta contains bacon, onion, garlic, mushrooms, tomatoes, tarragon, oregano, béchamel sauce and double cream. After combining with the pasta, the mixture is topped with parmesan and breadcrumbs and browned in the oven. This excellent pasta dish is served with crusty bread. 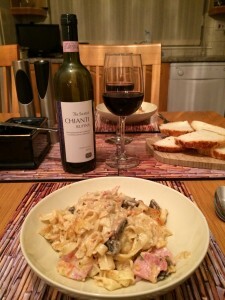 The creaminess in the sauce should have pointed us in the direction of something like a Chardonnay, but some of the flavours in the sauce suggested an Italian red might work and we opened a bottle of the Society’s Chianti Rufina 2011, an Italian red from the Wine Society. This is a good wine, but not quite a good enough match with this particular meal. 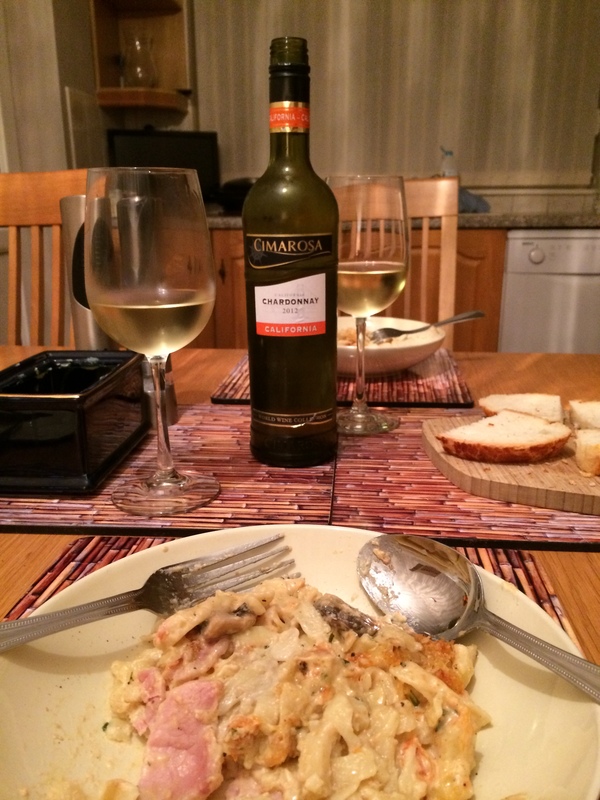 We switched to a bottle of Cimarosa California Chardonnay 2012 from Lidl, thinking it should be able to cope with the creamy sauce and it did. There was a bouquet of tropical fruit and these followed through in the flavours, which were accompanied by pineapple and a smooth, buttery creaminess from the oak. A good match with this meal.